Desalination Update illustrates the growing research and development activities in the field of desalination of water. The chapters in this book also show the close link in the supply of water and supply of power. Power is needed to desalinate water, and water is needed to produce power via steam and cooling water. As the world is becoming increasingly in need of water and power, the education of generations of new workers in these technologies makes the publications of these books of rising importance. Students and specialists alike will find branching strands in this field of development worthy of dedication of careers. Never has shrinking essential resources and exploding needs confront mankind as much as water. Excellent reviews in this book provide keywords, concepts, and current knowledge and status of practice useful for teaching and continued evolution. 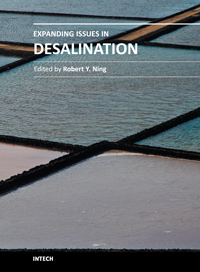 For this book, the term “desalination” is used in the broadest sense of the removal of dissolved, suspended, visible and invisible impurities in seawater, brackish water and wastewater, to make them drinkable, or pure enough for industrial applications like in the processes for the production of steam, power, pharmaceuticals and microelectronics, or simply for discharge back into the environment. 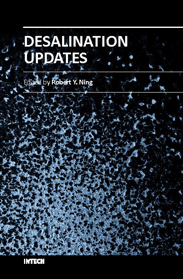 This book is a companion volume to “Desalination, Trends and Technologies”, INTECH, 2011, expanding on the extension of seawater desalination to brackish and wastewater desalination applications, and associated technical issues. For students and workers in the field of desalination, this book provides a summary of key concepts and keywords with which detailed information may be gathered through internet search engines. Papers and reviews collected in this volume covers the spectrum of topics on the desalination of water, too broad to delve into in depth. The literature citations in these papers serve to fill in gaps in the coverage of this book. Contributions to the knowledge-base of desalination is expected to continue to grow exponentially in the coming years. This book is a companion volume to two published in 2011 by INTECH titled “Desalination, Trends and Technologies” and “Expanding Issues in Desalination”. The term “desalination” used in this series is in the broadest sense of the removal of dissolved, suspended, visible and invisible impurities in seawater, brackish water and wastewater. The purpose of desalination is to make water drinkable, or pure enough for industrial applications like in the processes for the production of steam, power, pharmaceuticals and microelectronics, or simply for attaining acceptable qualities for discharge back into the environment. This volume touches on Membranes and Systems, Solar Desalination, Reverse Osmosis Process Chemistry and Control, Drinking Water Quality, and Selective Waste Product Removal. 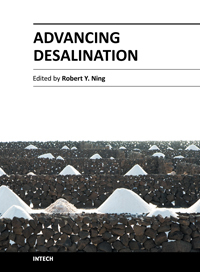 The value of these volumes on the vast topic of desalination is to present the landscape to students, teachers and practitioners, with key concepts and keywords useful in gathering publications through internet search engines. The technologies of desalination of water are advancing as rapidly as the cry of human kind for more availability of quality water supply while minimizing environmental pollution. Contributions to the knowledge-base of desalination are expected to continue to grow exponentially in the coming years.